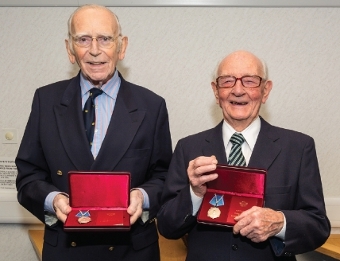 THREE local Royal Navy veterans were honoured by the Russian Government at a special ceremony on Friday evening. Woking men Douglas Potts, Reginald Guy and Edward Tann were distinguished guests at the reception held in the Civic Chambers, where they were each presented with the prestigious Ushakov Medal. The accolade is bestowed upon British servicemen in recognition of their bravery and courage in supporting their allies in the former Soviet state during the Second World War. As part of the Lend-Lease programme, highly secretive missions – later dubbed the Arctic Convoys – were vital in delivering supplies across war torn Europe to the former Soviet Union between 1941 and 1945. Mr Guy and Mr Potts accepted their medals from the presentation party of Woking Mayor Tony Branagan, and senior representatives from the Russian Embassy, Sergey Fedichkin and Sergey Nalobin. Royal Navy Commander Graham Turnbull accepted the award on behalf of Mr Tann, who was unable to attend the event. Historic Foreign and Commonwealth Office rules had previously prevented British veterans from accepting the Ushakov award. However, Foreign Secretary William Hague, overturned that rule in 2012 after years of lobbying by veterans’ groups, among them Councillor Carl Thomson, who previously studied Russian at university. President Vladimir Putin personally presented the first of these medals during a state visit to Downing Street in 2013, where he praised the unparalleled heroism of those involved in the convoys. Upon receiving his medal, Mr Potts, from Pyrford, recounted some of his memories as a Sub-Lieutenant in the infamous convoys: “I was only 17 years old when I was a Midshipman on board HMS Duke of York. We supported a Russian convoy which, on December, 26, 1943, was attacked by a German Battleship. Chobham resident Mr Guy, who had joined the Fairoaks Home Guard when just 15, before enlisting on HMS Volage, added: “I am honoured to receive the Ushakov Medal this evening. Cargo and munitions conspicuously carried across the Arctic Ocean to the northern most Russian ports of Arkhangelsk and Murmansk included tanks, fighter planes, fuel, and food; which helped to relieve food shortages during the siege of Leningrad. The route of the convoys was highly hazardous due to the proximity of German air and submarine forces, coupled with the extreme temperatures and perilous sailing conditions. Winston Churchill famously once described the route as ‘the worst journey in the world’. During its operation, the Arctic Convoys saw 85 merchant vessels and 16 Royal Navy warships lost, while 3,000 British sailors were killed. Several depictions of the notorious journeys have been serialised in subsequent years, including Scottish novelist Alistair MacLean’s 1955 account, HMS Ulysses. It is believed that the Russian Government have extended the offer of medals to approximately 800 British Arctic Convoy veterans. Similar ceremonies to that in Woking have also been held across the UK, including in Cardiff and Manchester in recent months.